What a difference two or three decades makes. 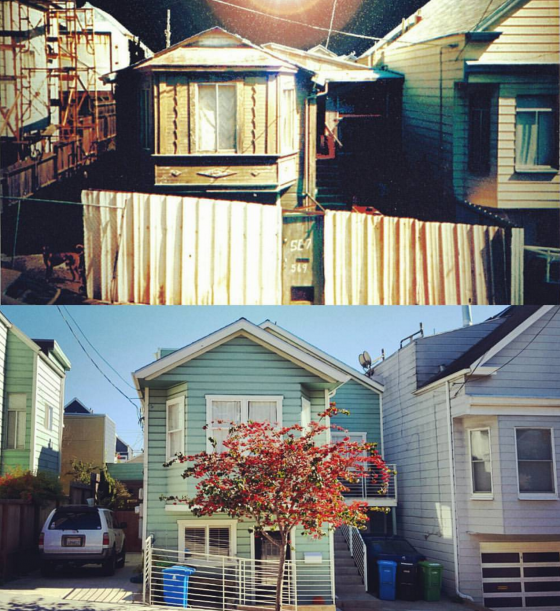 We called this “the Hell’s Angels house” or “the Cheech and Chong house.” On the top we see it c. 1980s, and on the bottom today. This house had so much drama that my brother and I, who didn’t have a TV, would often turn out the lights in our living room and watch the fighting and drunkenness. Guns, knives, family disputes, and high speed chases ended up here. These guys were straight from the cast of Sons of Anarchy. But they were also good neighbors, when they were sober. Dave, the main occupant in the 80s, was handy with motors and installed our garage door, still in use today. And we were told to knock on his door if we were in trouble. After the 89 quake, when portions of the city were burning, he rustled up a flat bed truck, big TV, and generator, and the whole block watched the news there on Moultrie Street.